I needed to make a lot of thank you cards for my students, so I decided to go postcard style. I typed my message to my students on the computer, ran Naturals White Cardstock through the printer, and stamped on the other side. I chose Naturals White because it's a heavier weight cardstock, so I can print on one side and stamp on the other without either showing through. 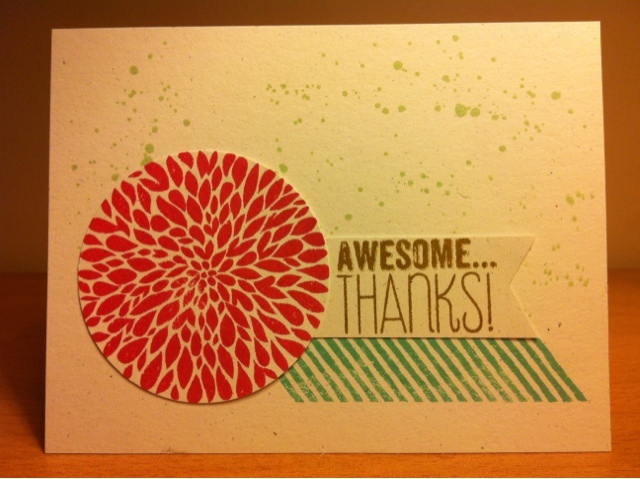 I used three different stamp sets on this card; Gorgeous Grunge, Betsy's Blossoms, and Yippee-Skippee! For ink I used the 2013-2015 in colors Strawberry Slush, Coastal Cabana, Baked Brown Sugar and Pistachio Pudding. The Strawberry blossom is punched out with the 2-1/2" circle punch, the sentiment flag is one inch wide and the end is hand cut. Hopefully a couple of these will end up on the fridge instead of the recycling! Labels: Betsy's Blossom, Gorgeous Grunge, Thank you, Yippee-Skippee!